I love the fall season – pumpkins, apples, spooky stuff, witches – you name it! It’s especially my favorite time of year to create! To kick-off fall here, I decided to put together 31 Halloween themed art journal prompts. We’ve got monsters, we’ve got potions, we’ve got spiders, we’ve got pumpkins…if you’ve been wanting a reason to get creating, you’re sure to find something that sparks your creative mood in this list! Most importantly, you should kick back and relax and let yourself make a gigantic mess of paint and paper. You should also totally get together with some friends and do these prompts together. Yes! Please DO share these prompts for any sort of personal, educational or other type of non-commercial use! These prompts are not in any order – you can choose to them randomly in an existing art journal, or even make an entire art journal dedicated to Halloween art. Not sure you want to use them for an art journal? Use them to inspire some wall art on canvas, or make a doodle a day on artist tiles or index cards. Have a Halloween ATC swap with your friends. Truly, No rules, no limits. You don’t even have to do these in September/October before Halloween! If you’re only finding this post 6 months from now in February and you like some of the ideas, why wait? I mean, I posted my mixed media daffodils video in September. It’s okay to have fun with these any time of the year. 1. Haunted House: This could be a spooky take on the whimsical mixed media style of houses, a doodle or a sketch, or maybe even the interior. 2. Spider Web Inspired: Spider webs are amazing to look at up close. Even if you are a little creeped out by spiders…They are fantastic weavers and spinners! Make a spider web design to use a background if you’d like! 3. Silhouettes: This is a great time to explore using silhouettes in your artwork! They can be mysterious figures, pumpkins, witches cackling in the moonlight or even just shapes you like painted in the traditional halloween colors. 4. Shadows: One of the easiest ways to help make art go from “flat to all that” is to practice adding some shadowing. Play around with some lighting on objects and try to illustrate an item with its shadows! 5. Hidden Spooky Eyes: Add a set of hidden spooky eyes to your page! 7. Around the Cauldron: Think witches, spells and potions to inspire something creative. 8. Stereotypical Classic Ghost: I recently learned about the movie A Ghost Story from a longtime blogging friend…I haven’t seen the movie yet, but I love the idea of how the movie makes one of the main characters the stereotypical ghost from a sheet. It’s the classic ghost, and perfect inspiration for an art journal page. 9. Edgar Allen Poe: Quoth the raven, nevermore… You can always find inspiration from Edgar Allen Poe stories and quotes! 10. Potions & Spells: Take inspiration from apothecary type bottles or a witch’s spellbook or maybe concoct a recipe for a spell you wish existed! 11. Dias De Los Muertos: I have always so admired the traditions, customs and artwork of Day of the Dead – so much inspiration! 13. Dress-Up: What do you like to dress-up as for Halloween? Take inspiration from a costume or if you’re like me and haven’t decided yet…you could always have some fun cutting out images of clothes from magazines to put together some wacky or spooky outfits. 14. Moonlight Sonata: Use the moon as inspiration for a page – whether it’s a moonlit scene or aliens playing music in outer space with the moon as a backdrop. 15. Treats: Have a favorite Halloween treat? 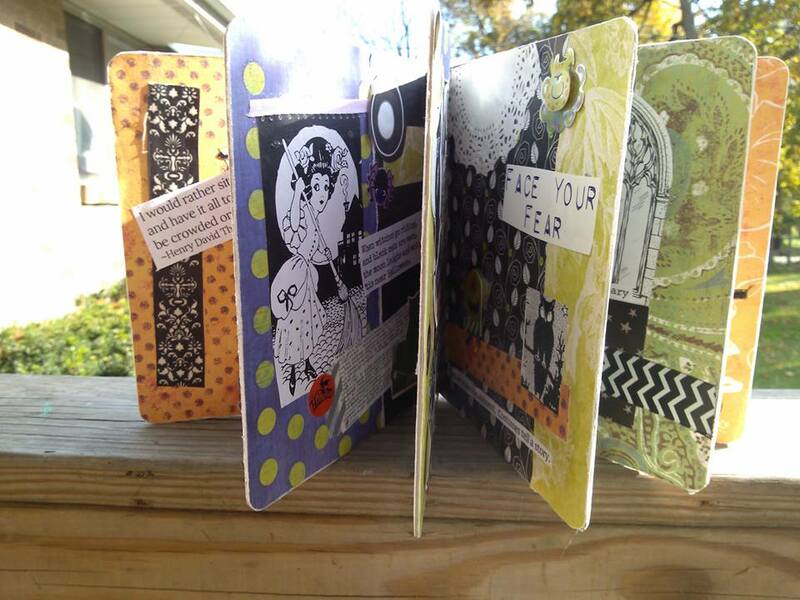 Create a page all about it, or use candy wrappers as ephemera in your junk journal. 17. Pumpkin Patch: Create your own pumpkin patch scene or use photographs you enjoy. 18. Paint it Black: Get out the black paint! If black paint is too dark/dreary for you, you can also always use it as a base layer behind brighter colors to give your work a different effect! 19. 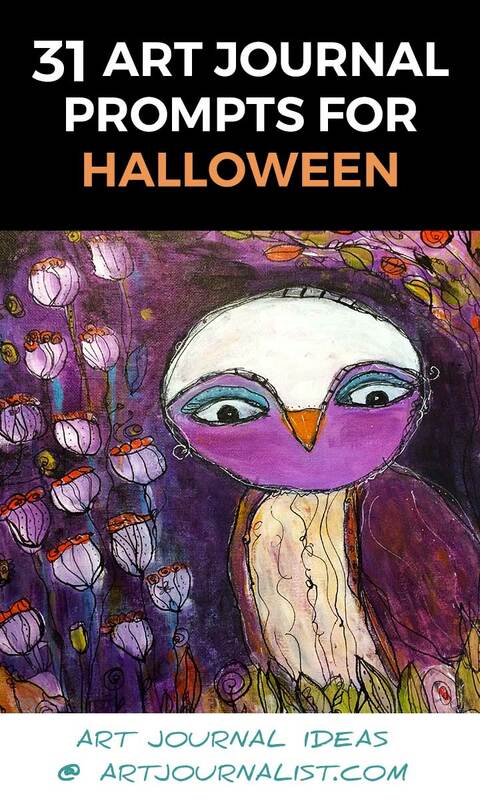 Owls: I love owls anytime of year, but they should definitely be a must on this list of Halloween Art Journal Prompts! Serious or silly, spooky or cute – your choice! 20. 31 Things Gratitude List: There’s never a wrong season for practicing gratitude! Challenge yourself to think of 31 things you’re grateful for. 21. Hidden Pockets + Secret Doors: This is a great way to experiment with adding secret doors and pockets to your junk journals! I like to use envelopes to create hiding places in my journals for notes, tags, and more. 22. Halloween Color Scheme: Create a page using traditional Halloween color scheme colors, like purple, orange, green, and black. 23. Spooky Village/Cityscape: I love creating mixed media city scenes – would definitely be fun to make one specifically for a Halloween theme. 24. Fear Quotes: A friend recently shared with me the quote: Fear is an acronym for “False Events Appearing Real” and I quite liked that. There are a lot of quotes about facing fears or overcoming challenges – use one of your favorites as inspiration for a page. 25. Halloween Traditions: Does your family or a group of friends have any special traditions for Halloween? Make a page inspired by one of the things you love to do this time of year. 27. Things That Go Bump in the Night: Take some inspiration from the sounds/sights/and mood of the night: creaky floorboards, raccoons + other nocturnal creatures, the wind howling, etc. 28. Fall Festival: October is full fall festival season here! Take inspiration from a local festival near you, or incorporate flyers or ephemera you might gather from local October events in your city or town. 29. Autumn Trees: How could I have gotten this far without including trees on this list of Halloween art journal prompts? I’ve always loved the way bare trees look against the sky – take inspiration from your favorite trees this time of year for a page in your art journal. 30. Unsolved Mysteries: Sometimes the scariest things are the unknown. What are some of the great mysteries you’ve always wondered the answer to? Again, this could be serious or silly – pondering the mysteries of life or wondering what ever happened to that pair of scissors you lost. 31. Halloween Jokes: What’s a ghost’s favorite amusement park ride? The scary-go-round! I’m not much of a fan of tricks, but I do love a good Halloween pun or silly joke. Use something funny that is Halloween related for inspiration for your page. I hope you enjoy these Halloween art journal prompt ideas! If you make anything with them, I’d love to see what you create! Tag your creations #artjournalist on instagram, or join our all new Art Journalist community Facebook group to share what you make!